Timbers Kovar is committed to getting your loading dock operational quickly, while saving you time and money. We have the right part for over 75% of all dock equipment made in the United States. We can provide parts for Serco™, Rytec®, Kelley®, Pflow® , Autoquip® lifts and scissor lift equipment, Bishamon® lifts, Chase Doors™. In some applications we supply universal parts, adaptable to many brands such as Rite-Hite®, McGuire®, Pentalift® etc. We stock these parts so our customers don’t have to. We also supply replacement parts for your truck restraints. Serco®, Kelley®, STAR 4®, Pit Bull®, SL 60®, APS 2000® & Dok Lok®. 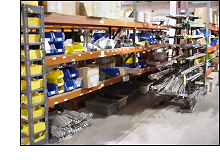 We supply mechanical, electrical and hydraulic components for most of the manufacturers mentioned. Most parts ship within 24 hours via UPS Ground. We also carry Rite Hite® dock lock parts. Rite Hite® dock lock parts selection manual. Timbers Kovar is your trusted service center in Akron and Canton to get your dock door operational. We have the parts and qualified service technicians to take care of any commercial door problem. We can repair high speed doors, impact doors, sectional and rolling steel doors. We carry many hard to find parts. We even have a phone app to contact us quickly. Using our phone app you can let us know what your repair problem is and even take a picture to show us the section that needs attention. Use the following links to download our app today. A broken dock lift can put your business out of commission. We understand that repair of a dock lift is important to your business and we offer emergency repair service for all types of dock lifts. We can service air lifts, scissor lifts, tilters and turntables. We carry many of the parts in stock and can get your dock lift working for you. Timbers Kovar is the name to remember for all your loading dock repairs. We understand that keeping your door operators, dock doors, and lift equipment running is critical to your business.